SPECIAL OFFER AT THE MOMENT......! 10.95 € PER 3L BOX INSTEAD OF 11.95 € ! The majority of wines sold in supermarkets are either sourced from négociants or co-operatives. This brilliant, quality conscious family estate grow and market all their wines and the difference really shows through after tasting. 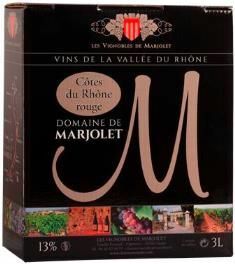 Based in the southern Rhône Valley this Grenache Syrah blend is big and spicy with persistent red fruit flavours.